Mỹ Sơn (IPA: mǐˀ səːn) is a set of ruins from the ancient Cham Empire in the central coast of Vietnam. It is a UNESCO World Heritage Site which is commonly visited as a day trip from Hoi An and Danang cities. Mỹ Sơn is a UNESCO World Heritage Site in South-Central Vietnam, and is believed to be the longest inhabited archaeological site in Indochina. Much of the site was destroyed by US carpet bombing during the Second Indochina War (US: Vietnam War; Vietnam: American War.) It is considered one of the foremost Hindu temple complexes in Southeast Asia, and one of the most important heritage sites of this nature in Vietnam. Mỹ Sơn was recognized as a World Heritage Site by UNESCO in 1999, under its criterion C(III) — evidence of an Asian civilization which is now extinct. Mỹ Sơn is a Hindu temple complex built by the Champa, a united kingdom of various tribes of the Cham ethnic group. The Champa ruled South and Central Vietnam from the 3rd century until 1832. 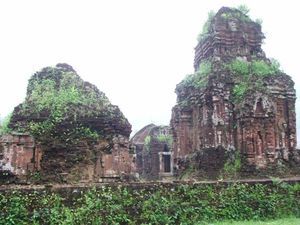 Upon their succession, Champa kings would build temple complexes at Mỹ Sơn. The Champa people were predominately Hindus, and the temples at Mỹ Sơn are dedicated to the Hindu deity Shiva. The earliest temples were built of wood in the 4th century. These structures were destroyed by a massive fire, the exact cause of which is unknown. Subsequent kings rebuilt these temples in wood, then close-fitted bricks with no mortar, and finally in limestone. The majority of the surviving structures are Mỹ Sơn are brick. 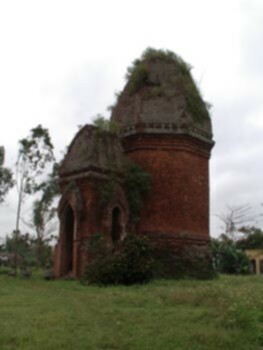 Between the 4th and 14th century, the Champa kings built at least 70 structures in the area, some times on top of the ruins of previous structures. These structures were decorated with sculptures of gods, priests, sacred animals (dragons, snakes, lions, elephants), and scenes of mythical battles. In addition to being a place of worship, kings and religious leaders were interred here. In 1832, the Champa were annexed by the Vietnamese Emperor Minh Mang, and the Mỹ Sơn temple complex was largely forgotten and was reclaimed by the jungle. In 1898, the Frenchman M.C. Paris rediscovered the complex during the French occupation of Vietnam. This led to the study and partial restoration of the site by the École française d'Extrême-Orient and other scholarly societies. Frenchmen Henri Parmentier and M.L. Finot are credited with extensively documenting the site as it existed at the time, including copious photographs. The documentation of the French scholars became especially important after the outbreak of the Second Indochina War (called the "Vietnam War" in the United States, and the "American War" in Vietnam.) The communist Viet Cong, who supported North Vietnam, took shelter in the ruins. In response, US B-52 aircraft carpet-bombed the region extensively for a week in August of 1969. As a result of this bombing, only 18 structures remain of the 70 or so originally documented by the French. Today, efforts are under way to preserve and restore the temples to the conditions documented by the French in the early 20th century. These restoration efforts involve the use of materials that is as similar as possible to those used by the original Champa architects. The restored sections of temples are readily visible and obviously distinguishable from the original sections, as the modern bricks are cleaner and a noticeably different color. Frenchman Henri Parmentier documented 71 temples in Mỹ Sơn in 1899. He organized them into 14 groups; the 10 most prominent of these groups were assigned letters: A, A', B, C, D, E, F, G, H, K. Each temple within a group is numbered, so temple E1 is the temple numbered 1 within the E group. The above map is displayed by the start of the walking path into the relics, by the tram drop off within the park. It includes a labelled group "L" which was not one of Parmentier's original prominent temple groups. Group K is on the left side of the map. Groups A, A', B, C, D, E, F, and G are connected by a paved walking path and easily accessible. Groups H, K, and L have not yet been restored, and are only accessible via walking trails through the underbrush. The name Mỹ Sơn means beautiful mountain in Vietnamese. The temple complex is located in a valley, surrounded by mountains, the sides of which are covered in thick jungle. Hon Quap (Cat's Tooth Mountain) overlooks the site, its crooked peak mimicked by the architecture of some temples' roofs. These mountains are the source of the Thu Bon river, a holy river which flows through the site. As a result of the US military bombings during the Second Indochina War, there are some bomb craters still visible within the temple complex. The most noticeable of these craters is located by the temples of Group F.
The park is open from 6:30 to 17:00, but the later afternoon hours are calmer and not too hot. Bring water. 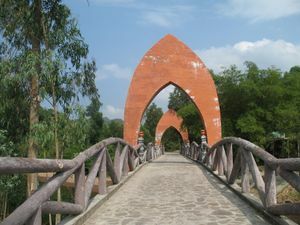 Admission to the historic area is 150,000VND. Most people visit My Son on tours. Since the ruins are relatively small, the park is easily overwhelmed by the large volume of visitors. It is best to visit in the late afternoon when the tour groups have departed. Most tours depart by 2:00 PM. From Hoi An take Hung Vuong Street and keep following it towards the town of Vinh Dien for about 7 km until you pass under a highway. Take your first left after the curve and go straight for about 100 meters. At the T junction on Route 1 (or 1A) turn left towards the South. Drive for 7 km (4 mi) to Nam Phuoc and take a right at a blue sign for My Son. From there, keep following the signs for 30 km (19 mi) until you reach the entrance for My Son. If you use private car for transfer from Hoi An to My Son, you can ask for quote at Huracars (they offer a 4-seater car for 35USD).Once safely arrived at My Son Sanctuary, you will be given the chance to explore this breathtaking location – with the walking relatively easy and flat, it is suitable for all ages. It is a 1-hour drive by car or motorbike from Hoi An. Parking is inside the park, and costs 5,000VND. A round-trip on a motorbike taxi from the center of Hoi An should cost about US$10, a 4 seater car about US$35 and a taxi about $40. The rural scenery on the way to My Son is among the most beautiful in the country. A private driver and car runs about US$70 from Danang (My Son admission excluded) with return trip included. The most common way to visit My Son is via organized tour from Hoi An. Tours are also available from Danang, though these are usually much more expensive as they are less popular and involve longer distances. Sunrise tours, which arrive at the park very early, when the ticket office first opens at 6:30. (Note that "sunrise" is a marketing gimmick; with the exception of possibly a few days in December, sunrise always happens before the park opens.) These tours depart Hoi An at 5:30, arrive around 6:30 and usually include fewer people than the regular tours. They depart from the park around 9:00. Regular tours, which begin arriving after 8:30 in the morning. These tours are generally large (30+ people) and may include tour guides. Regular tours will depart by 14:00. Some tour operators also provide the option of returning to Hoi An by boat. After leaving the park by bus, visitors are taken to a ferry location by the Route 1 bridge, approximately 40 km (25 mi) from My Son and 10 km (6 mi) North of Hoi An. At this point, visitors transfer to a boat for their return to Hoi An. This option is usually more expensive, and the return trip takes an additional hour. Hotels, guest houses, and travel agents sell tours, or can direct you to an agent who does. 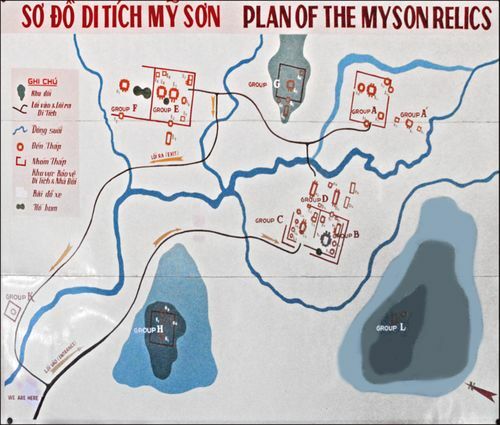 Note that tours marketed as "My Son boat tour", which claim to go to My Son via boat, will only go as far as the previously mentioned ferry terminal; make sure that transportation from the boat to the My Son complex itself is included. Vehicles are permitted up to 100 meters (109 yards) from the temples. Logistically speaking, only motorcycles are permitted within the park proper, and it will be necessary to convince park management that you have a good reason to not leave your vehicle in the parking lot. A few minutes' walk beyond the ticketed entrance (past the museum and across a small bridge) is a tram station. Here open-sided electric trams ferry tourists 2 kilometers along the paved jungle road to the relics. Tourists are free to walk instead of taking the tram; however the road is only just wide enough to fix two trams side-by-side, and there are no side walks or shoulders. The tram drivers do drive quite quickly, which may be disconcerting to pedestrians. The tram drops visitors off at the start of the relic area; this is also the furthest point vehicles are allowed. If you've brought your motorcycle into the park, it will need to be parked here. There is also a building to the left of the relic area entrance where one may hire a tour guide. The walking path through the main restored temple groups is unidirectional and leads in a large loop through the complex. It terminates at a small rest area, with toilets, souvenir shops, a cafe, and the pickup for the return tram to the entrance. With the exception of the small Champa museum by the entrance, the My Son temple complex is not wheelchair accessible. Near the ticket office there is a Champa museum, describing many of the artifacts and the history of the site. Another museum exists near Group A. These museums contain well-preserved sculptures from the surrounding ruins. Accordingly, try to visit the museum briefly before visiting the temples themselves — it closes a half-hour before everything else, so you might not be able to catch it on the way out. The temples are in varying states of (dis)repair, with restoration still underway on some. They are situated in ten "groups", labeled A-L. Four of the sites (A, B-C-D, E-F, and G) are located in the same general vicinity. The H, K, and L ruins are separate, but clearly marked on large maps situated frequently throughout the ruins. All of the sites are connected by reasonably well-labeled walking tracks. The entire layout of the temples is according to the sun and rays of the sun; in the early morning this is clearly visible. The early morning sunlight shines behind the head of Lord Vishnu from where it is scattered throughout. The layout should be Sanskrit scriptures are first, then the Lingham over which water flows to wash hands and feet before entry barefoot into the temples. These buildings are places of worship, a UNESCO sanctuary, and should be treated with respect by everyone. There are traditional dancing displays 9:45AM for the benefit of the tour groups (except Mondays). The stage is right before you reach the first group of ruins, across from the souvenir shop. How "traditional" these dances are is questionable. The streams running through My Son end up in a still lake about 3km long which is ideal for kayaking. Hardly anyone knows about or uses this (for now) unspoilt lake! Karma Waters (http://www.karmawaters.com) operates tours including kayaking on My Son lake, Guided hiking tours, history & culture tours. There is a souvenir shop within the site. It sells the basic Vietnam souvenirs and also a selection of items from Champa culture. Numerous Vietnamese style road-side cafes and places for tourists to eat and drink line the road from Hoi An to My Son. Tourist buses usually do not stop along the route; some tour and bus operators receive commissions from pricey tourist restaurants. Drinks and snacks (of the junk-food variety) are on sale next to the souvenir shop inside the temple compound. There's no accommodation available in My Son. The nearest hotel is about 2 km (1 mi) down the road from the ticket office. Most visitors day-trip from Hoi An, Da Nang, or even Hue. Don't wander too far from the clearly-marked walking tracks between the sites. Although authorities say that the area has been cleared of any unexploded mines or shells, you're a long way from help in case of an accident. If your interest has been piqued, Da Nang has an acclaimed museum dedicated to Cham sculpture. Just past Tra Kieu heading towards My Son on the left is the small but excellent Sa Huynh Museum which includes some artifacts from Cham (free of charge). Building shape is more Cham than Vietnamese. Many of the artifacts were donated by a Catholic Priest who lived in Tra Kieu. The Cham Islands are seven islands which can be visited on a boat tour from Hoi An. This page was last edited on 5 September 2018, at 07:00.